Have you seen the latest Raptor F-150? It’s a top pickup truck with a special design. Rugged, sporty, and quite modern, the Raptor turns heads on any road, and many truck drivers love the power that you get from the twin turbo V6 engine. Some have compared the Raptor’s power to a Ford GT, and you’re able to maneuver better with the FOX Racing Shox suspension system and BF Goodrich all-terrain tire package. There are also six driving modes in the latest Raptor design. You’ll be able to get an EcoBoost or choose Baja-style for those who want an adventure. 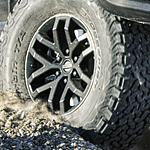 You can handle anything in the Raptor with its amazing shocks and rugged design using military-grade, aluminum-alloy materials. It’s no wonder that this truck received high praise from critics at US News & World Report. The F-150 has also been ranked in the top full-size pickup trucks for 2019. Want to check out the latest Raptor? You can stop by Mark Moats Ford to get more information.